Attorney General Jeff Sessions spoke out after The New York Times published an interview in which President Donald Trump was critical of Sessions. 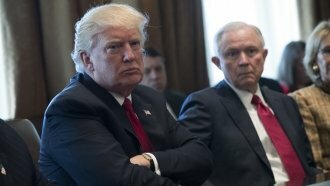 Attorney General Jeff Sessions said Thursday he remains committed to leading the Department of Justice despite President Donald Trump's public criticism of him. "We love this job. We love this department, and I plan to continue to do so as long as that is appropriate," Sessions said during a press conference on an unrelated matter. Sessions' statement came hours after The New York Times published an interview with Trump. In it, Trump criticized Sessions' decision to recuse himself from the investigation into Russian interference in the 2016 election. Trump told the Times: "If he was going to recuse himself, he should have told me before he took the job, and I would have picked somebody else. ... It's extremely unfair, and that's a mild word, to the president." CNN's Pamela Brown asked Sessions: "How do you feel like you can effectively serve from here on out if you don't have the confidence of the president?" Sessions replied: "We're serving right now. The work we're doing today is the kind of work that we intend to continue. ... I'm totally confident that we can continue to run this office in an effective way." Later in the day, the White House said while disappointed in Sessions' decision, Trump "has confidence" in his attorney general. NBC's Hallie Jackson asked White House Principal Deputy Press Secretary Sarah Huckabee Sanders in an audio-only briefing Thursday afternoon: "You say he has confidence in him, does that mean he does not want [Sessions] to resign?" Sanders replied: "I think you know this president well enough to know that if he wanted somebody to take an action, he would make that quite clear." In response to Trump's latest comments, Democrats on the House Judiciary Committee again asked the chair to hold hearings with Justice Department leaders over "the damage being done" to the department by the Trump administration. As The Hill reports, Republicans issued statements of support for Sessions on Thursday. But few were critical of Trump's comments — at least on the record. Some unnamed Republican Senators did criticize Trump's statements while speaking to CNN.